University of Wisconsin Press, 9780299312305, 216pp. Efforts to preserve wild places in the United States began with the allure of scenic grandeur: Yosemite, Yellowstone, the Grand Canyon. But what about the many significant natural sites too small or fragile to qualify as state or federal parks? George Fell was determined to save these places, too—prairie remnants, upland forests, sedge meadows and fens, ocean beaches, desert canyons, mountain creeks, bogs, caves and gorges, and the full spectrum of other habitats essential to biological diversity. 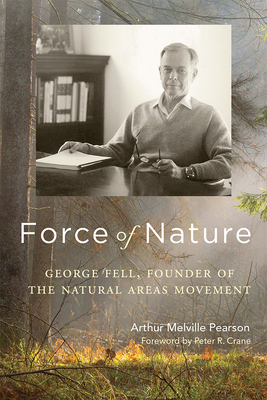 Force of Nature reveals how a failed civil servant, with few assets apart from his tenacity and vision, initiated the natural areas movement. In the boom years following World War II, as undeveloped lands were being mined, drained, or bulldozed, Fell transformed a loose band of ecologists into The Nature Conservancy, drove the passage of the influential Illinois Nature Preserves Act, and helped spark allied local and national conservation organizations in the United States and beyond. Arthur Melville Pearson is the director of the Chicago Program at the Gaylord and Dorothy Donnelley Foundation, which helps protect and restore natural lands in the Chicago region and the Lowcountry of South Carolina. His writing has appeared frequently in the magazines Chicago Wilderness and Outdoor Illinois and in the blogs A Midewin Almanac and City Creatures.